We aim to enable as many visitors as possible to experience the stunning views that Emirates Spinnaker Tower has to offer. With access to our View Deck at 100 metres and to The Clouds at 105 metres via the internal lift, guided tours, informative guide books and other facilities, the experience of a visit to the South’s must-see attraction can be enjoyed by many. Our view deck at 100 metres and The Clouds at 105 metres can be accessed by the internal lift. Unfortunately the Sky Deck (our highest view deck) is only accessible by stairs. In the unlikely event of the Tower being evacuated and the internal lift being unavailable, visitors would have to descend using our emergency staircase of 560 stairs. Due to fire and safety procedures, visitors with mobility impairments who can use the staircase with some assistance, may be admitted to the Tower a maximum of 2 visitors at any one time. Those visitors who could not use the staircase are limited to one visitor at any time. To facilitate their visit we have an Evac+Chair as well as a trained member of staff available. That visitor should be able to transfer themselves, or with the help of a carer, to the Evac+Chair and also not exceed 23 stone in weight. We recommend that all visitors with mobility impairments book in advance to avoid disappointment. For further information or to book your visit please call 023 9285 7520, option 3. 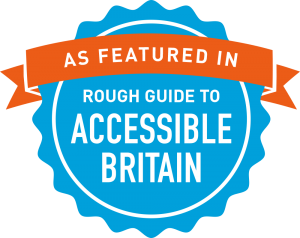 An Accessibility Guide is available to download here.